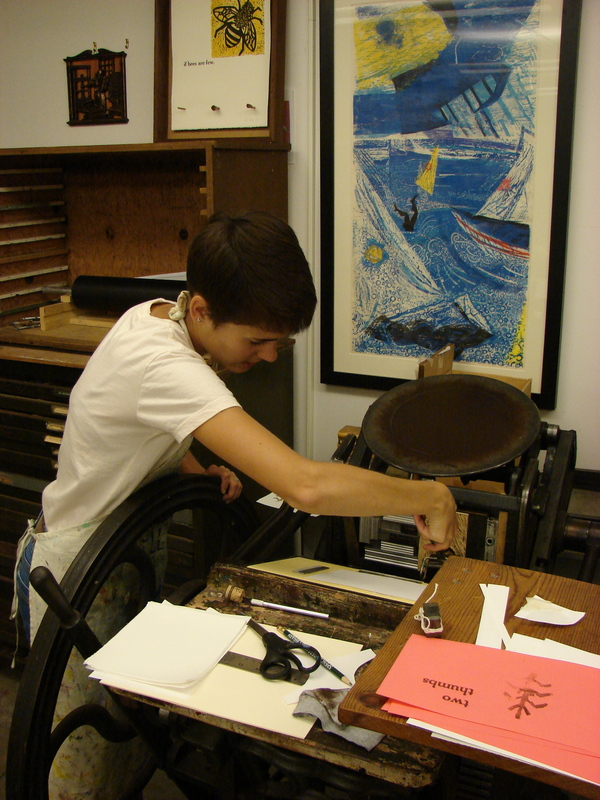 The Lawrence Arts Center owns 3 different presses–a press from Gutenberg’s day, a clam shell press (the next press after Gutenberg), and an electric press from the 1970s. I’m sure you’ve gathered that I value doing things the “real” way, the way that involves manual labor; obviously I was opposed to using the electric press from the 1970s. The Gutenberg was out of the question. You know how your family has the electric can opener that only 1 person in the house can use? It only works if you slam the sharp part into the can’s lid and hold the can at a precise angle? That’s how the Gutenberg press was, old and held together by bungee cords; only one woman at the LAC knew how to actually work it, and she was away for the summer. The next best option for an old manually operated press was the clam shell press. I am not good at talking about mechanical things, but I will do my best (if you don’t want to read mechanical descriptions, skip down a few paragraphs). After choosing a color, you put a six or seven small drops of ink on the press’s circular metal plate. You must then get the press started and keep it going until the ink is spread evenly across the metal plate and the press’s rollers. You start the press by spinning the wheel quickly with your hands. Once you’ve picked up some momentum, you move from spinning the wheel to powering the press with a foot pedal. 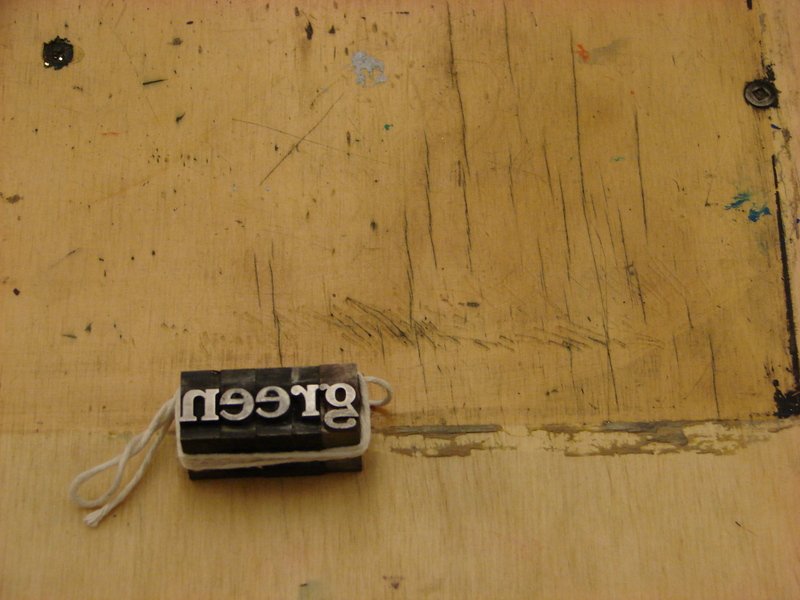 As you run the press, the rollers move up over the metal ink plate, get ink on them, and then ink the type. After the ink is spread evenly, you have to pull a lever that probably has a name. This allows the type to press into the paper you’ve set up. You continued running the press by pumping the foot pedal and spinning the wheel with your hand. After you make a print, you simply change the piece of paper and continue doing this until you’ve finished the project. This is quite the work out, requiring lots of physical effort (ie authenticity); I was elated. The mechanical part is over; if you got bored, start reading again. I’ve left out the entire “getting everything set up” part of the story; this can take anywhere from 20 minutes to an hour, depending on the project. Before using any ink, the paper and the type have to be lined up correctly (ie straight, the right height, etc). The degree of impression the type makes on the paper is also important. 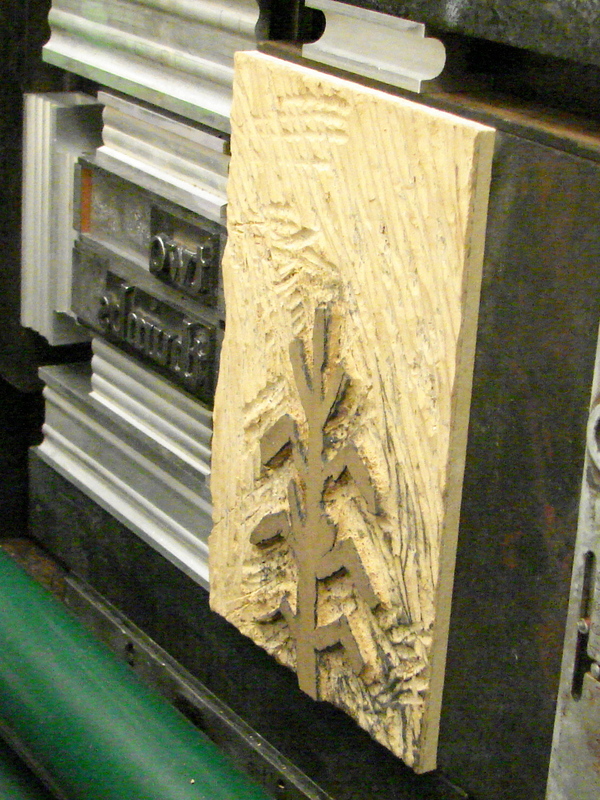 True pressmen, will check the back side of a piece to see how well the type made an indention in the paper. This is key; there must be an impression. If the impression isn’t well defined, you must stack scrap paper behind the paper you want to print on (called backing paper) until the desired impression is achieved. 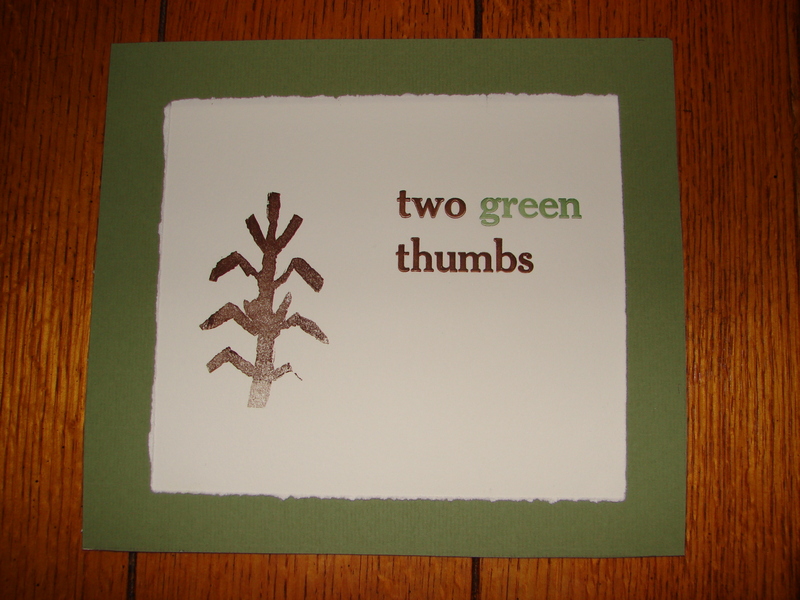 I told Tim that I wanted to do “two,””thumbs,” and the corn stalk in brown ink and “green” in green. He said that sounded great. He was excited about this idea because he people always printed the type and image separately on the clam shell press; I was happy to be doing something different. We spent 45 minutes adding oddly shaped pieces of backing paper behind my image and type, trying to get their impressions to be the same. Tim had a revelation: no one ever printed the image and type at the same time because the linoleum block was just slightly shorter than the type. Because of this height difference, getting the impressions to be the same was nearly impossible. After another 15 minutes, we decided that the imperfection (the way that the image faded out near the bottom), looked artistic, like I was trying to make it look faded. And obviously, I was. This blog is four months late, but it’s about gifts that were secrets, so it’s warranted. Plus, I knew the winter months would be busy in the school world and dead in the gardening world, so I was saving it. After this blog, I officially have no other blog ideas lined up, unless you want to read about the garden-related gifts I got for Christmas or pumpkin stuff I made two months ago; I think we can all agree that pumpkins are sort of done for the year. As you’ll remember, I had a decent amount of free time over the summer. 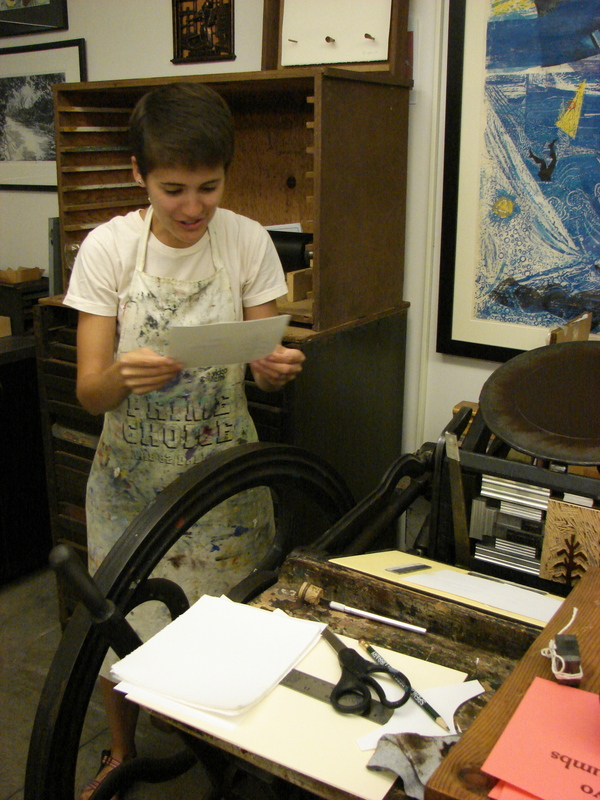 I decided to take a class at the Lawrence Arts Center–Letterpress. If you are below the poverty line (which I am), you can get a scholarship where you only have to pay a down payment of 10% of the class’s cost and then depending on your level of poverty, the decide how much of a scholarship to award you and how much you still need to pay. Sometimes they even forget to send any bill at all and then you forget to call them about it, and before you know it, you’ve taken an art class and used really expensive, breakable machinery for 8 weeks (sometimes unsupervised) for only $11. 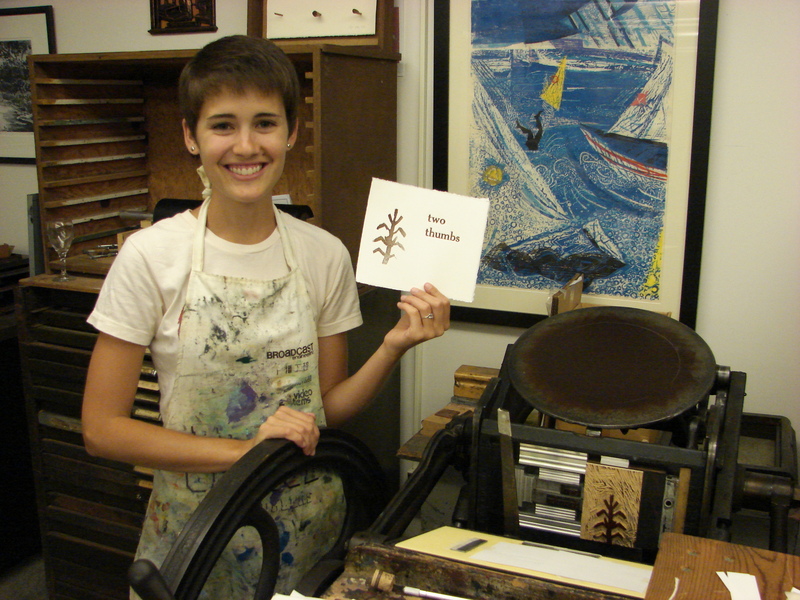 I chose the Letterpress class because of a course I was enrolled in last Spring–English 800 aka learning how to be an English grad student. One of our units was learning about the printing press. The culminating activity of this unit was being a test that required us to know every single part of the printing press, the entire process of making a print, and all the different people involved. Although I abhorred the test, wasn’t sure why I need to know about the printing press to study English in 2010, and took every opportunity to complain about it, I liked the idea of actually making something on the press. 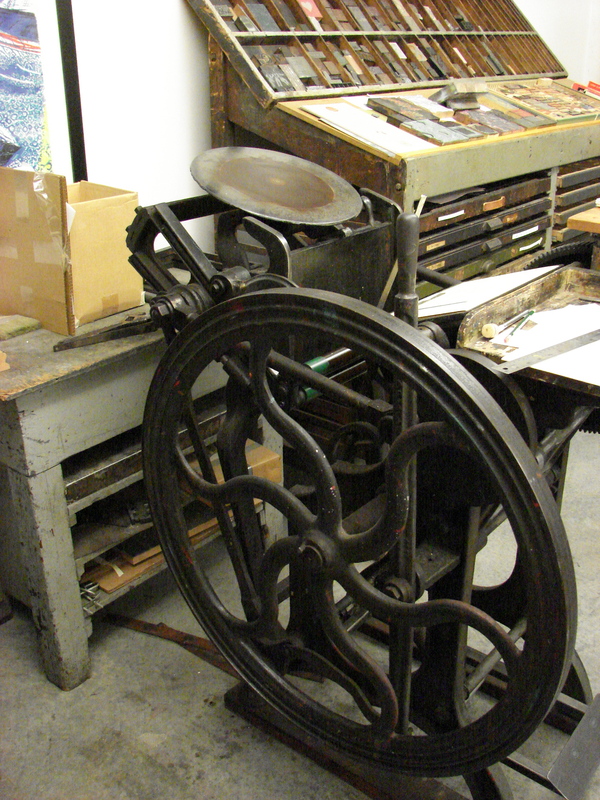 On the first night of class, our instructor Tim, a man in his forties with a pony tail, gave us a little printing press tutorial, explaining its history and how the different presses worked. Tim was also a gardener. I already knew the names and history; I was that proud third-grader falling out of my desk, eagerly raising my hand to answer every question. 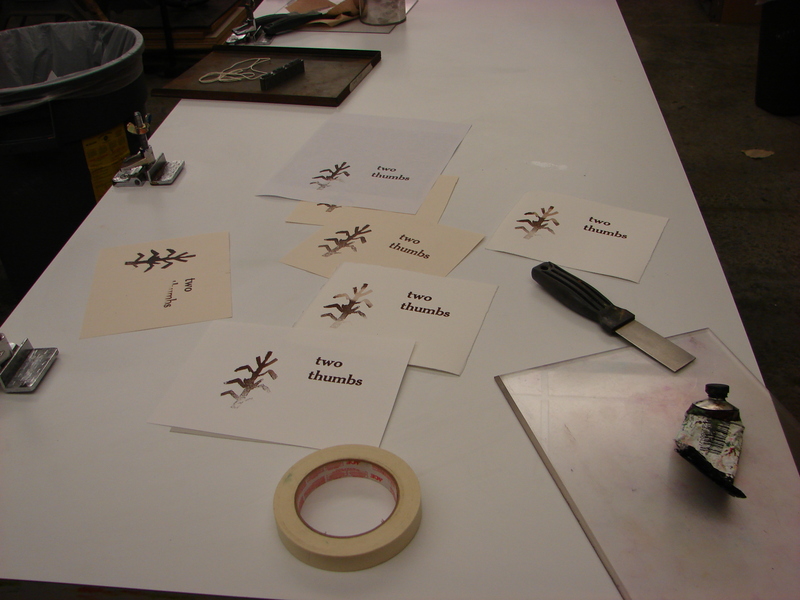 After Printing Press 101, Tim asked about the kinds of projects we wanted to make. The women in my class (yep, all women) wanted to make things like invitations, thank you cards for a wedding, and business cards. I had no idea what to make, so I asked what he thought was manageable in 8 weeks. He said we could probably finish one bigger project and maybe a smaller project (cards or something) after that. He also suggested choosing a big type as opposed to a smaller one. I thought this seemed a little lazy–only 2 projects in 8 weeks? Yeah, right. We’d have loads of time. I wanted to make something garden-y (surprise!). There were a few images already in the print room, but the only thing that came close to gardening was a cornucopia full of unidentifiable vegetables. Tim said I could draw my own image on a linoleum block and then carve it out. My mom swears that I used to be able to draw Disney characters really well, but those skills left me long ago, so I decided to go for something simple: a stalk of corn on a necklace from my Hopi jewelry phase in 1999. During the second class, I drew the corn stalk and carved it out of the linoleum block; this took the entire 2 hours. I accidentally carved off one ear of corn, but assumed this was okay; sometimes ears of corn fall off. Next came the writing. I thought of gardening words–Plant, Grow, Harvest, Life–but they all seemed cliché. The blog didn’t influence my decision, but I settled on “Two Green Thumbs.” I like the idea of green thumbs; it implies that the garden needs you/me. We are good at gardening, and we contribute something to the garden’s growth. I chose a font and found a relatively large type. 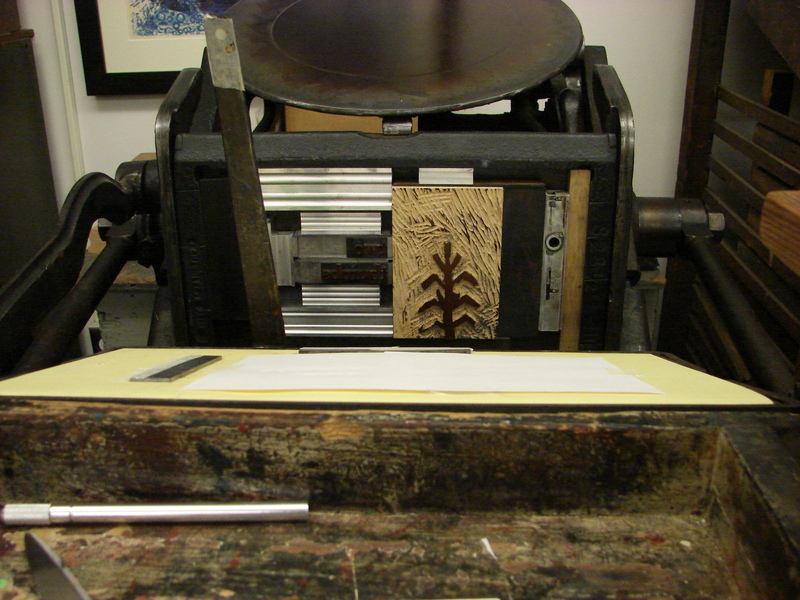 Then I set the type–upside down and reading backwards–in the composing stick. I did a few test runs (in the first, the “u” of thumbs was upside down) and locked everything into the frame. Finally, I cut the thick paper I had bought to the size I wanted it. This took another class period and a half. After three weeks, I was ready to actually print. I am only sort of in the know with bands. I know the bands but I don’t necessarily find the bands. There’s a big difference. We value finding the bands—or they—am I a we? I found a new radio station online, a radio station that plays bands I identify as “cool,” and other bands I can’t identify as anything but that I like. This seems like a good enough sign. I listen to it almost every day now, and I feel connected to the we people. I also feel like I might get to share a new song or band with someone sometime soon. This has not happened in awhile. Well, maybe I’ve shared a band that was new to them, but not a band that was new to me. I turned up the volume on the Macbook Pro, anticipating the knowledge I was about to consume. New music and plants—woah! How lucky that I turned the station on at this exact moment. And then, loud, cool, indie rock.